The Glyndebourne props team. Photo: Sam Stephenson. 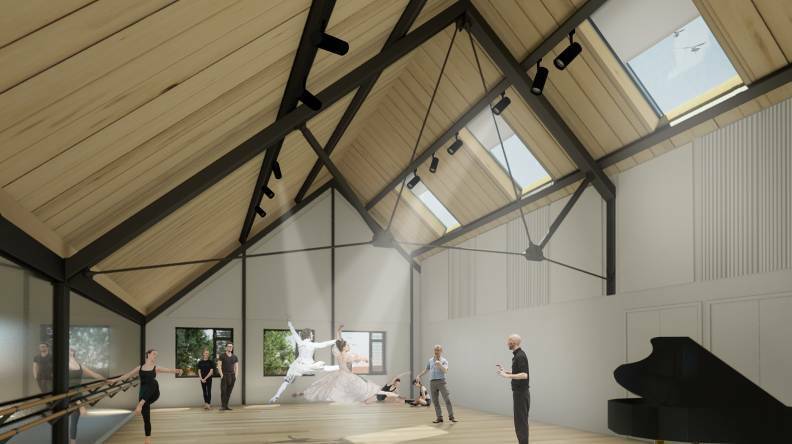 This year donations to our Annual Fund will help us to purchase essential equipment, including a sprung dance floor, to be housed inside Glyndebourne’s state-of-the-art Production Hub; due to open in 2019. Those that give a donation of £1000 and above will be invited to an exclusive pre-opening tour of the Production Hub. During 2018 a new Production Hub will be built on the site of our previous props and wig workshops. This will become home to Glyndebourne’s props, carpentry, costume, makeup and wig departments, as well as a state-of-the-art dance studio and much needed music practice rooms. Charlie Snee, Membership Co-ordinator, spoke to the prop makers to find out more about what this means for them. Listening to Paul Brown, Head of Props, it is clear that his team made exceptional things happen in a space they had outgrown. I have always been in awe of the work they achieve, but I hadn’t realised that the pressure for space has been their enemy. 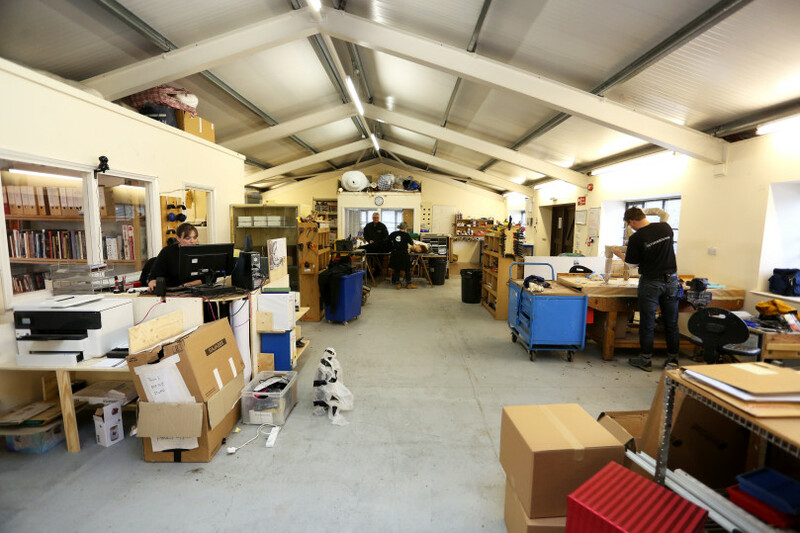 Over three years ago the idea of refurbishing the props workshop to provide more space was just a dream. The temporary building already has areas assigned to particular activities – a sewing room, areas for welding, painting. The old workshop had some of these spaces added on after the original build, but it was never ideal. And these changes only solved part of the problem as Paul explains: ‘We were asking for money to be spent on the building so we could keep using it, not to improve it.’ And props weren’t alone in requiring a better, more usable space. The Hector studio, housed beside the props building was often used for dance rehearsals, but it wasn’t as wide as the proscenium arch on stage, so transferring to the main stage was often challenging. There were plenty of things that needed fixing and some of them just couldn’t be done in the available building. Once Paul was given the go ahead to start thinking about a new space that would fulfil their needs, the ideas were plentiful. Visits to other theatre workshops – Royal Opera House (ROH) Thurrock and the National Theatre – helped cement ideas of how a new build could work. The Production Hub project is being managed by Glyndebourne’s Technical Director Eric Gautron and Sarah Hopwood, Chief Operating Officer. Nicholas Hare Architects were appointed in 2017 to design the new building, and as part of the design process, Paul was tasked with putting a brief together for the props part of the project (other heads of department including Pauline Lecrass, costume; Dave Turner, stage; Sarah Piper, make-up and Sheila Slaymaker, wigs; had to do the same for their department’s needs): ‘Analysing in depth the way that you work isn’t something you often have to do. We have had to plot out the way we work with colleagues in other teams.’ Paul shows me the diagrams that illustrate the links between teams. ‘It helped us focus on what we needed’, he says. From these it is clear that the main props office is the centre of the team’s work – where requests arrive and are divided up and assigned – so this had to be easily reached by colleagues coming across from the main theatre building and the other departments, as well as acting as a central hub for the props team themselves. The outward design of the building was selected to fit into the landscape, inspired by the look and feel of a Sussex-style barn, it will blend into the landscape. Glyndebourne’s Garden Adviser, John Hoyland and Head Gardener, Kevin Martin, are also involved and will ensure that landscaping around the Production Hub works as well as the building itself. The heavy duty areas – props and carpentry – will be housed on the ground level, with costume, wigs, make-up and rehearsal spaces upstairs. All areas will be linked by glass walkways, providing great scope to include these making areas on our audience tours. The offices vacated by the costume department will house the costume store (currently off site), which will be linked to the Production Hub by a covered walkway – a significant improvement in efficiency. Deciding where everyone would work was quick to materialise: ‘Once we had the space decided we began to figure out which rooms we could use for what,’ Paul explains. ‘With a workshop it isn’t enough just to fit all the machinery in, you have to be able to use it too.’ In the carpenter’s workshop for example, this meant plotting a layout for the room, and then checking whether it would work with scale models of the largest pieces of wood they work with. Currently, the props team are in the midst of ‘deciding where to put light switches, plug sockets, how doors need to open if your hands are full of props’ on the architect’s plans. Prop makers Ruby, Rose and Bryony all return the same answer when I ask what they are most looking forward to – ‘the space!’ they chorus. Paul adds ‘it won’t radically change what we do, but the new building will allow us to concentrate on the craft rather than the logistics.’ In the old building projects couldn’t run concurrently – ‘we couldn’t paint whilst someone was sanding wood nearby for example, in the new building we’ll have more space to be creative’ he adds. 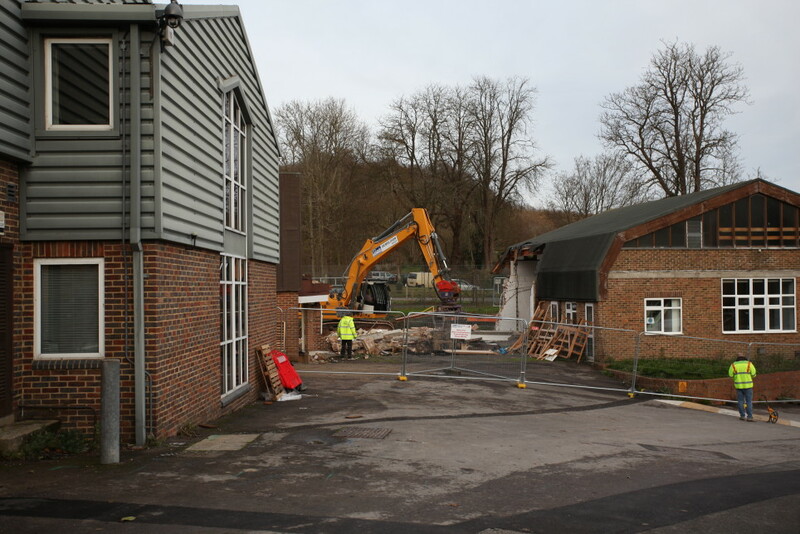 The old buildings have now been demolished to make way for the new Production Hub. They were dismantled carefully to enable a large amount of the wood and steel to be taken away for recycling. The brick walls and old concrete floors have been ground up to make a rubble mix which will be used in the base of the new building. We have committed to recycle 96% of the materials from the demolished buildings. We have also committed to keeping the impact of the new building to a minimum. Glyndebourne’s Production Hub wouldn’t be possible without generous legacy support. Your donations to the Annual Fund, large or small, are invaluable in maintaining our standards of excellence.